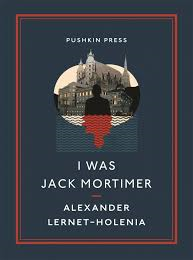 In 2013 Pushkin Press had a hit with Alexander Lernet-Holenia’s thriller I Was Jack Mortimer, recently reprinted in their new Vertigo series. 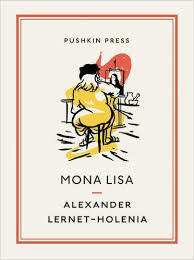 It’s no surprise, therefore, that they have released another of Lernet-Holenia’s stories from the 1930s, Mona Lisa, also translated by Ignat Avesy. Those familiar with I Was Jack Mortimer, however, will find Mona Lisa a quite different work: gone is the mid-twentieth century, middle-Europe setting, so associated with noir that it’s easy to believe life was lived in black and white; instead we are in the much sunnier streets of Renaissance Florence where Leonardo da Vinci is still adding the occasional brush stroke to his masterpiece. Faced with the choice – accept what everyone is telling him, that Mona Lisa is deceased, or pry open her tomb just to be sure – he does what any self-respecting fictional character would and returns with a crow-bar and some friends. Bougainville’s efforts to prove Mona Lisa lives (and to locate her) are also (unsurprisingly) detrimental to French-Italian relations in the city as his passion makes him headstrong, to say the least, when questioning her husband. Therein lies its beauty, and its danger. Alexander Lernet-Holenia was an Austrian writer who had the misfortune to be of an age to fight in both the first and second world wars, and the good fortune to survive both. He was a prolific author, writing not only novels but poetry and plays; even his novels can be apparently divided into those that are intended to be serious works of literature and those that are primarily entertainment. It perhaps shouldn’t be a surprise, then, that Pushkin Press has unearthed I Was Jack Mortimer (one of his entertainments) for translation given their previous success with Mitteleuropean writers such as Stefan Zweig and Arthur Schnitzler. I Was Jack Mortimer uses the now familiar (though, no doubt, less so in 1933) starting point of many a thriller: the ordinary man innocently caught up in extraordinary circumstances. Its protagonist is Frederick Sponer, a taxi driver, whose life is turned upside down by one unlucky fare. That fare is, of course, Jack Mortimer, whose journey to the Hotel Bristol is interrupted by the three shots which kill him. Sponer is at first oblivious and then (when he discovers the body) panicky: after two failed attempts to tell the police he becomes anxious they will simply assume that he is the murderer. He decides, therefore, to dispose of the body and spend the night as Jack Mortimer in the Hotel Bristol to throw the police off his trail, a plan that goes remarkably well until Mortimer’s lover turns up, closely followed by her husband. The novel begins relatively slowly with Sponer’s fascination for a wealthy young woman, Marisabelle, who rebuffs all his advances, but proceeds to a frenetic pace the moment Mortimer’s death is discovered. What I particularly liked about it was not simply the twists and turns of Sponer’s story, but the author’s willingness to interrupt that and take us elsewhere. There is, for example, a sudden change of scene when we are presented with the back story of Mortimer’s lover’s husband before that character has even appeared in Sponer’s story. This happens more subtly later when we leave Sponer and follow his girlfriend, Marie, as she attempts to aid him. (Although it has to be said that the competition between Marie and Mrisabelle is far from subtle in the way it is played out). I Was Jack Mortimer may not be a neglected classic, but it is an excellent thriller – it is no surprise to learn that it has been twice made into a film (in the 1930s and 1950s). In Lernet-Holenia, Pushkin Press has discovered yet another writer that I, for one, want to hear more from. You are currently browsing the archives for the Alexander Lernet-Holenia category.